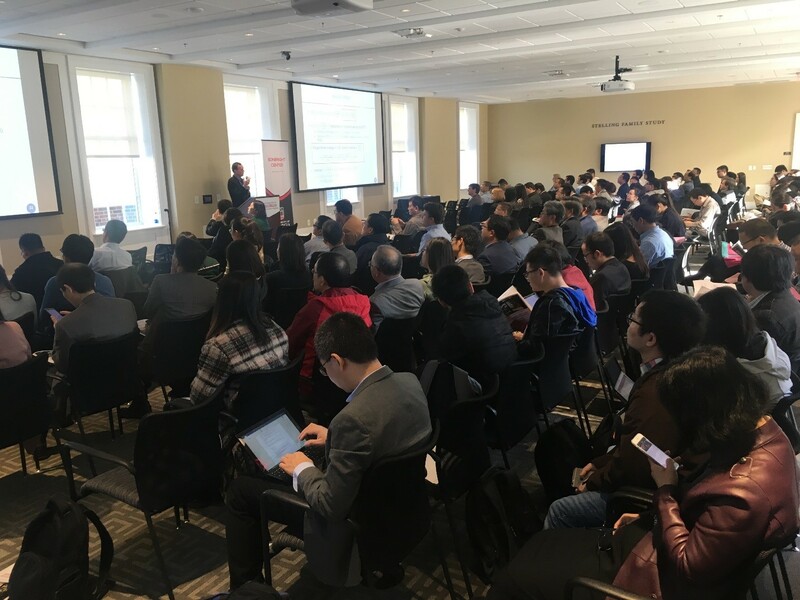 The Chinese Economist Society (CES) hosted its 2018 North America conference from April 5 – 7, 2018 at the University of Georgia (UGA), Athens, GA. The theme of this year’s conference is “Regulatory Impact Analysis: Methods, Applications, and Implications for Emerging Economies.” Thanks to the diligent work of our organizing committee members, the conference was a huge success with a record-breaking number of 219 abstract submissions, and 202 attendees. CES subsidized 43 students and 10 junior scholars for them to travel to the conference. With funds from the UGA Office of the Senior Vice President for Academic Affairs and Provost, the conference waivered registration fee for 51 students. The conference organized two pre-conference training sessions on publishing and geographic data. A pre-conference reception in the evening of April 5th was sponsored by the UGA Department of Health Policy and Management (HPAM) and the CES. At the reception, Dr. Stuart Feldman, Interim Head of HPAM, and Dr. Marsha Davis, Associate Dean of the College of Public Health offered welcome. CES President Zhuo Chen introduced guest speakers and former presidents of the CES. The conference was formally opened in the morning of April 6th with remarks from Professor Benjamin Ayers, Dean of the UGA Terry College of Business; Ms. Jie Long, Consul and Director of Education, Consulate General of the P.R. China in Houston; Ms. Xiangrong Wang, President of the China Association for International Exchange of Personnel in Atlanta; Professor David Mustard, Professor and Director of James Bonbright Center for the Study of REgualtions, UGA Terry College of Business; and Professor Zhuo Chen, President of the Chinese Economists Society. CES acknowledges generous financial and logistical support from our co-organizer, the James C. Bonbright Center for the Study of Regulation at UGA, and our co-host, Center for Financial Development and Stability, Henan University. In addition, we would like to acknowledge the support from the UGA Office of the Senior Vice President for Academic Affairs and Provost, Department of Public Administration and Policy, School of International and Public Affairs, Department of Health Policy and Management, College of Public Health at UGA, Gregory and Paula Chow Foundation, and Society for the Study of Emerging Markets. We also thank our institutional members and advertisers for their continuing support.